ORANGE YOU GLAD IT'S THAT TIME OF YEAR? with overflowing abundance every year. To borrow a phrase from my Christmas-celebrating friends: It’s the most wonderful time of the year! Chinese New Year, also known as the Spring Festival, is the festive period for those of Chinese descent; be they from the Mainland, Hong Kong, Taiwan, or Overseas Chinese such as myself. Imagine 15 days of festivities beginning with the reunion dinner on the eve of Chinese New Year (when the entire family converge to commemorate the past year with a splendid feast. Roasted suckling pig compulsory) until the Lantern Festival, with many visits to friends in between. There will be fireworks! There will be calorific snacks (pineapple tarts, sweet pork jerky, mandarin oranges, peanut and sesame cookies)! 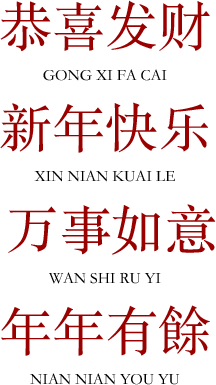 There will be hong bao (red envelopes of cash for the unmarried)! Chinese New Year follows the lunar calendar and so the date changes every year, usually between mid-January to mid-February. Each year is defined by one of the 12 animals in the Chinese zodiac: Rat, Ox, Tiger (yours truly), Rabbit, Dragon, Snake, Horse, Sheep, Monkey, Rooster, Dog, and Pig. This year, 2019 is the Year of the Pig, and begins on February 5th. Ahead of the Year of the Pig 2019 I have not only test run my new year resolutions to see which are feasible (if I break them, it doesn’t count - at least according to the lunar calendar) but also added adorned both myself and my London home for Chinese New Year. As you would...! A CAMPHOR WOOD CONSOLE IN MY MOTHER'S DRAWING ROOM. IN SPRING, HOPE BLOSSOMS, AND SO DO PLUM TREES. A scroll painting of plum blossoms - a Chinese symbol of hope and courage as the new Spring season arrives - hangs over my Qing console table. A stack of mandarin oranges, the seasonal snack of choice, balances on a gold Ming ceramic stool. On a side table, a Chinese-inspired lamp by India Jane holds court over an incense stick holder, an empty Wedgewood scented candle jar repurposed as a vase of pink peonies, and a 1st edition of Crazy Rich Asians*. Various tassels in red, orange, and blue with a jade pendant, as well a brush adorn as hanging ornaments. *A fun story about this. A room in the residents’ lounge where I live (which I affectionately doubt the House of Commons) is being transformed into a study/co-working space. I answered the call to arms for donations: contributing board games, DVDs, coffee table books, classics, and novels including my 1st edition of Crazy Rich Asians. Until someone from the Book Club said, in horror, “That will be worth something, someday!” So guess who sheepishly went to concierge, hat in hand, and asked for her book back? I had the decency to appear mortified. A VIGNETTE OF CHINESE INFLUENCES AND INSPIRATIONS. BLUE & WHITE STOOLS? SO BASIC. GO FOR GOLD, BABY. "FLORALS FOR SPRING FESTIVAL? ...GROUNDBREAKING." New year, new you, new clothes, sweetie darling. And I’m not just making that up to justify shopping: it’s a widely-held Chinese belief that new clothes are the right way to symbolise a new start. Some people go the extra mile and sleep in new pyjamas the night before so that they’d wake up in new threads on Chinese New Year. The traditional way to dress for Chinese New Year is to wear a qipao, also known as cheongsam. The most auspicious colour to wear is red; which symbolises happiness, passion, and luck, and gold; said to symbolise luxury and wealth. Your best bet is to wear traditional dress in red; adorned with gold on the piping, frog buttons, and embroidery; preferably in classic motives such as peonies, chrysanthemums, dragons, and phoenixes. This year, I bought fabric (silk, satin, jacquard cotton are my go-tos) and had my Chinese New Year qipao (the knee-length one) made to measure. Almost. I had the waist and hip area made an inch larger for more give, in anticipation of the inevitable bloat that follows the non-stop binge eating of the festive period. EEE BB U WAN TO RUIN CHINESE NEW YEAR...?!! Under no circusmtance are you to wear black and/or white on the first day of Chinese New Year. Black and white are mourning colours. Wearing black, white, black AND white *shudders delicately*, and even grey (depending on how superstitious you are) is an invitation for misfortune and terrible way to start the Chinese New Year. Some try to circumvent this by wearing black clothing embroidered in coloured jacquard - such as this qipao (left, bottom) - and some even get away with it if the embroidery are in auspicious colours such as gold or red. Personally, I think Chinese New Year is not the time to make daring colour choices, if only to spare the more superstitious elders their pearl-clutching. The one exception where black is auspicious is wallets: the Chinese believe that black wallets will attract and trap wealth. In a strange role reversal, red is a terrible colour for wallets: red evokes fire and supposedly makes one burn through their money. Did you know? 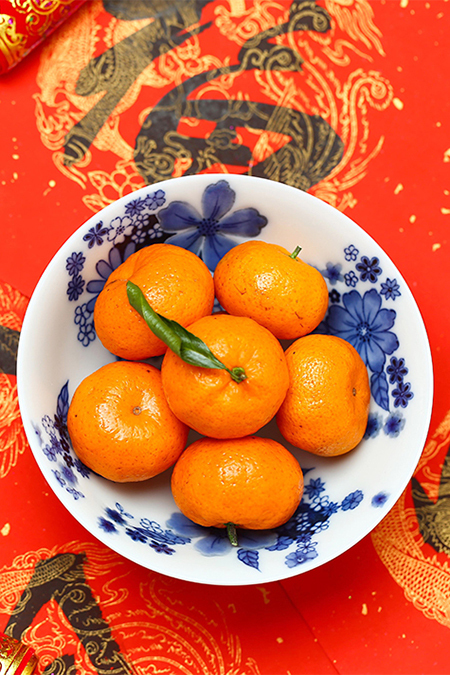 The mandarin orange is an important Chinese New Year symbol. It’s shape and colour resembles the sun, which is aligned with the yang (positive principle), hence its association with abundance and happiness. Whether you are part of the one sixth of the world that celebrates Chinese New Year the traditional way, whether your celebratory dinner today is an old-fashioned reunion feast with family or dim sum for one at Yauatcha; I wish you prosperity, happiness, health, and luck for the Year of the Pig.